Last Friday, the School of Diplomacy had the pleasure of hosting Ambassador Dessima Williams-Former Special Adviser on the Implementation of Sustainable Development goals (SDGs) as well as Former Ambassador of Grenada. In addition, Ambassador Williams has served as Grenada’s representative to the Organization of American States, Deputy Governor to the World Bank and Deputy Permanent Representative to the Inter-American Commission of Women. At the Organization of American States she was involved with the Caribbean as a Zone of Peace, Development and Independence and promotion of small island states. Ambassador Williams has also been a professor, advocate for rights of women and girls, and founded the Grenada Education and Development Programme. While she was Ambassador to Grenada, she simultaneously served as Chair of the Alliance of Small Island Developing States where she led a 40-island global climate change effort that worked to keep the rise of average global temperatures to 1.5 degrees in the Copenhagen Accord of 2009, which can be found in the 2015 Paris Agreement. She also participated in the Rio+20 and two of the UN SIDS conferences. 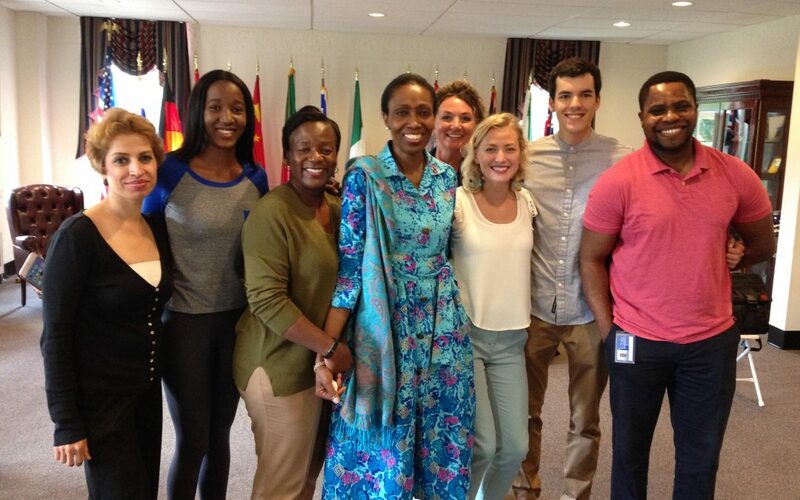 During her visit, she articulated the importance of everyone having a hand in the realization of the of the SDGs. Similar goals in the past have been left to the heads of government, but more can be done when we are all involved as we are all responsible for our future and we all must contribute. While she commended the work that was done with the Millennium Development Goals (MDGs), she said that a large part of the failure with the MDGs was because we did not have the entire population involved. The stressed the fact that the SDGs were crafted in a way that it is crucial that have “all hands on deck”. Part of her serving as an implementation adviser meant going all over the world (17 trips in 12 months) to see what people were doing to bring the goals of the SDGs to life. She was inspired by so many, especially the youth, who she claimed are the most important instrument in realizing the goals, as the youth will live to see the failure or success of their work in realizing the SDGs. One story she shared included the story of a Pakistani man who became an Oxford graduate. Growing up, his community, including himself, believed that no woman, including his sisters, should receive education. He even worked hard to ensure that they wouldn’t. Upon traveling abroad and witnessing first-hand the benefits and necessity of educating our entire population, not just a portion, he realized how vital education is to the health and well-being of all humans. Now, he is an advocate for education for all, and he began with ensuring his sisters had rights to an education. We all have different journeys and motives, yet she urged us to all be advocates, not only for the causes we care about, but as educators to others of why they too should support the SDGs. Being from Grenada, and reflecting on the recent climate change amplified hurricane destruction in the Caribbean, she contended: “if you have any doubts about climate change, talk to someone who is from an island.” As not all of us are feeling the immediate effects of some of the issues that the SDGs cover, we don’t always see a need an urgency to address them. But an important point that she made is that we all share a common denominator as humans-that is, the fact that we are all human. And whether directly or indirectly, what happens with other humans effects all of us. If we can help implement the SDGs, which strengthen populations, these population are able to stay in their home country where they want to be and we do not have issues of mass immigration and exodus or security threats and other related problems. Empowering our human brothers and sisters makes us all better off. For me, this was the most important point in illustrating the need for all of us to become invested and involved. Though she said much work has been accomplished since the establishment of the SDGs, we are all responsible for ensuring they are realized to their fullest capacity.